Before Soul got in touch with me to send their products, I had ordered myself a ring sling. The team was ever so kind to send it to me the very next day. I chose the cotton version over linen mostly keeping in mind the price point. I have been using it for over a month now and I have my opinions about it, good and bad. I have worn my little one in the sling over a dozen times so far and initially I used to thread and unthread the sling every time I used it. After a couple of times, I realised it would be better for me to test and thread the sling once properly and get as many uses out of it as can be. Next fortnight onwards, I did keep my threaded sling at the ready but loosening and tightening the sling does get a tab but difficult as the material of the sling is slightly more denser than linen. It will take some time for you to get used to it, just like I did but after getting the baby’s posture right and the snug, I have been wearing her practically all the time. She is still yet to fall asleep whilst being worn but baby hashtag does show signs of tiredness, so hopefully one day she will fall asleep while I am wearing her. The fact that the fabric of the ring sling is handwoven and 100% natural, makes for one hell of a product. It’s breathable, safe and wonderful for the baby’s skin. However, when you are wearing your baby for the first time, do make sure to follow the instructions to the T. It takes practise to get used to the sling but once you get the hang of it, it is the ultimate carrier option there is. I love how compact the sling is. It hardly takes up any space in the carry on tote or the diaper bag even. I just have one issue though. The place I live in is extremely humid owing to its proximity to the sea. So when I wear the baby, we tend to sweat a lot. If this happens at home, it is no bother at all. But if we step out in sling while I’m wearing her, there is no way I can take of the sling without making the sweat on the front of my clothes noticeable to everyone. 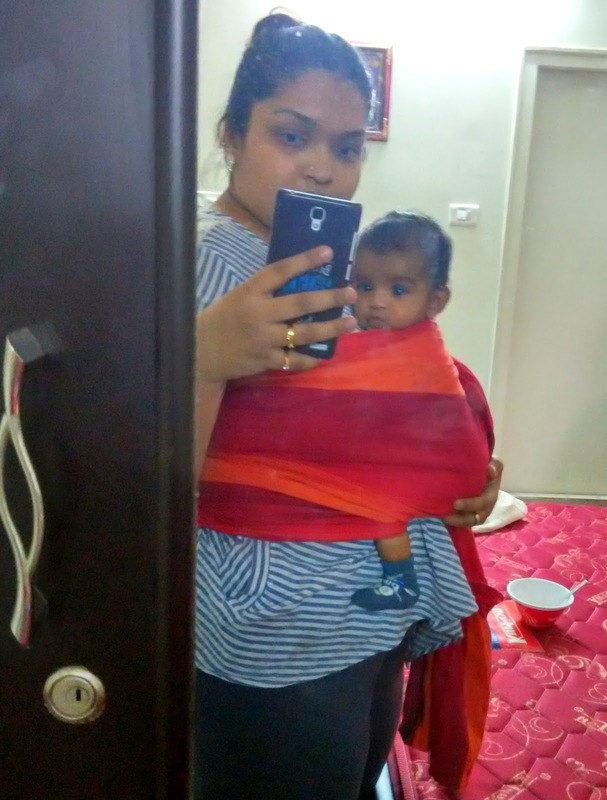 There is also no graceful way to wearing the sling (without the baby) in such a case unless I unthread it completely and drape it like a dupatta. This may sound trivial but this happened to baby hashtag, her papa and I when we stepped in to a five star hotel to relish a particularly delish brownie. 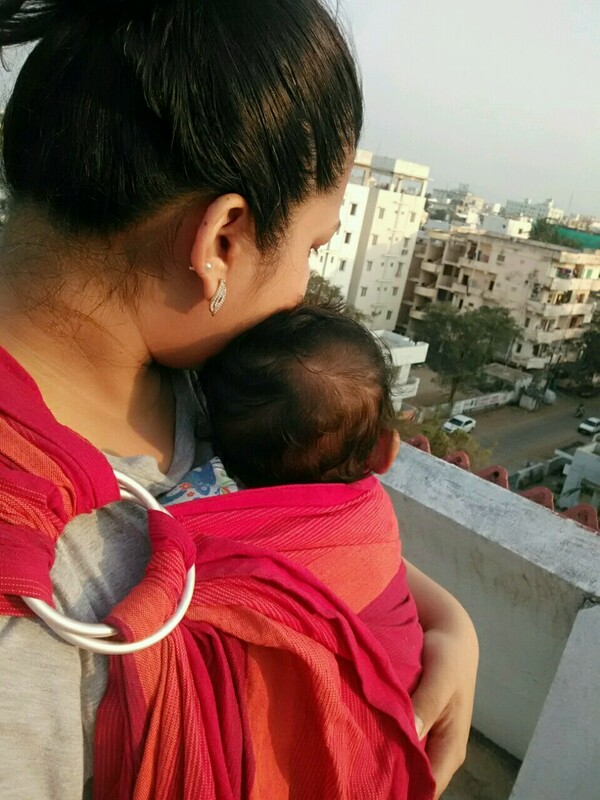 When I took her out of the sling, I was drenched in sweat and I could only cover it whilst still wearing the threaded sling as I was to wear the baby again on our way back home. Not the best look I’ve sported. All in all, I would recommend this sling if you are looking for a carrier to wear your baby. 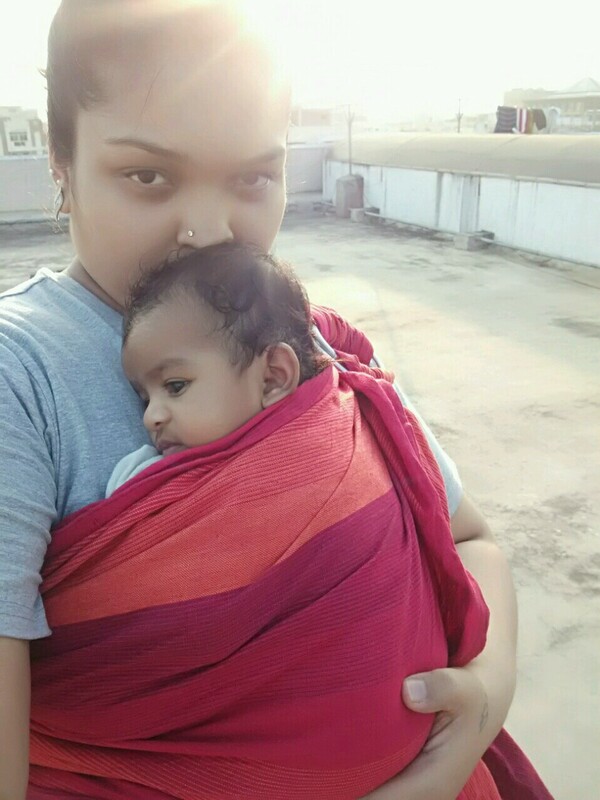 The versatility of the sling is such that it allows you to wear your newborn as well your toddler. If you have both, then try tandem wearing. If you have any doubts about their products, Soul is always ready to help you out. They are one of the most approachable brands I have met in recent times. And I am not a very easy person to please. Soul products come with self explanatory brochures that talk in detail about the product you have chosen along with the very many ways you can use and tie them (if it is carrier). They also have the most adorable variety of products, apart from the standard carriers. But more on that, in the next post. If you still need visual help as to how to use the Soul products, do subscribe to their Facebook channel. Will be back soon with a new post/review unless Baby Hashtag feels the need to take over the blog with her latest rant.